At the age of thirteen, having just arrived in Peoria, Illinois, I was placed in the fourth grade with boys and girls four years younger than I, and was introduced to the English language for the first time. The German, Dutch and Hebrew I had learned during my tumultuous “childhood” in Nazi Europe were not of much value at that time. It was not uncommon for me to sit through several showings of great screen classics, including The Best Years of Our Lives. These movies, along with radio, helped me to master my new language. How I found time to attend any movie is still a mystery to me, for I had worked after school ever since our family had reached Peoria in 1948. By age sixteen both my English and my looks improved considerably and this combination somehow inspired a young college sophomore to ask to walk me home at the conclusion of Yom Kippur services on October 10, 1951. At that time I was a sophomore at Peoria Central High School. That summer, Nathaniel — “that young college sophomore”– returned home to New York for vacation and work. We wrote to each other every day, but Nathaniel didn’t make it easy for me. To improve my English, he included in each letter ten words for me to look up in the dictionary and then use in a sentence. Not only did I comply with this request (how foolish I felt years later), but I wrote each of my letters to him on scrap paper with a dictionary by my side, and only when I was satisfied with the contents would I pen it in my best possible handwriting. I was graduated from Peoria Central High School in 1953, having managed to complete my high school studies in only two years (with summer courses), and ranked eighth in a graduating class of 267 students. Shortly after graduation, Nathaniel and I were married, somewhat to the chagrin of my mother and his parents. I was eighteen years old. This past August 2018, we were blessed to have celebrated our 64th wedding anniversary! Upon graduation from college, Nathaniel entered the U.S. Air Force, and after an intense training program, received his silver wings as a pilot. The Air Force experience gave me the opportunity to see more of our beautiful country. Our son, David, was born in Winter Haven, Florida and is married to Lisa; our daughter Susan was born in Waco, Texas and is married to Rob; and our son Michael, born in New York is married to Rachel. Our 3 sets of children gave Nathaniel and me nine beautiful grandchildren, 4 magnificent, outstanding, and adorable great-granddaughters, and one very handsome, great-grandson! Amazing! Amazing! I have been very interested in the medical profession for much of my life, and have been a Gray Lady and Candy Striper volunteer in various hospitals. I went back to school to become a medical assistant and worked for a most wonderful caring and professional doctor until his retirement at the age of 92! I have worked in other volunteer organizations, most notably PTA and Hadassah, of which I am a life member and a past chapter president of its 1,300 member Hewlett chapter. Having the Hadassah Myrtle Leaf Award presented to me was certainly a thrilling experience for me. . I am a life member of both the National Council of Jewish Women and Emunah. I have also served as a sisterhood president of Congregation Etz Chaim in East Rockaway. Since 1979 I have been speaking publicly about my Holocaust experience, but upon publication of my memoir, Four Perfect Pebbles, the number of speaking engagements has greatly increased. The Diary of Anne Frank has always fascinated me. I read it in the original Dutch on our voyage to America in 1948 aboard the Holland-American liner Veendam. Actually, my story is one that Anne Frank might have told had she lived. She was in Westerbork where I was. Eventually, from Auschwitz, Anne was sent to Bergen-Belsen where I also was, and where she tragically died from typhus in March of 1945. With God’s help, I was able to write about “camp” life, liberation, and finally, starting life anew; first in Holland, and later, in our blessed United States of America. I am thrilled that Four Perfect Pebbles has garnered wonderful reviews and awards, and that many schools use my memoir in the study of the Holocaust. It has also been published in Dutch, German, Hebrew and Japanese. 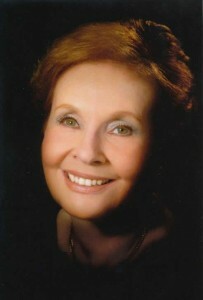 Of course, much of the credit should be directed toward Lila Perl, of blessed memory, my talented co-author. But the sweetest recognition was the Sydney Taylor “Best of the Bunch” citation, presented by the Association of Jewish Libraries. Forty years ago, when I was an elementary school PTA program vice-president, a Book-and-Author luncheon was held in our home, and the distinguished guest was none other than Sydney Taylor, the author of the outstanding series of books, All of a Kind Family. Much of my time these days is spent speaking in public, private and parochial schools of all denominations throughout the United States, Germany, the UK, and in Israel. I also speak to adult groups in churches, synagogues and civic organizations. I stress the need for love, respect and tolerance for one another, regardless of the religious belief, color of the skin, race or national origin. Life for me today is rich, full and rewarding, especially when speaking to and with young adults. Over one million students and adults in 40 states and 5 countries have personally heard my story, and important universal messages. My story is one of determination, perseverance, faith, and above all, hope. Marion’s Triumph, my documentary video, has aired on PBS stations nationally several times. Many awards have come my way,but the outstanding event was the naming of a high school in Germany in my honor – the Marion–Blumenthal–Oberschule Hoya. Although in our mid-80’s, Nathaniel and I keep a rigorous schedule, having made 21 round trip flights in 2017, plus auto trips to local venues. We do this as we know that today’s generation will be the last to hear first-hand accounts of that dark time in our history. Please click on the LINKS page for additional sites about the Holocaust, and Marion. 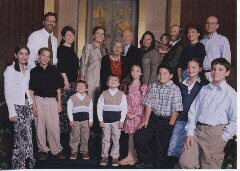 Photo from our 50th Golden Wedding Anniversary Celebration August 2003. There is Mom, right in the center, flanked by Nathaniel and me. To my right is our daughter, Susan, and her husband Rob. To Nathaniel’s left is Lisa and David, our eldest son, holding their youngest, Kasey Rose. 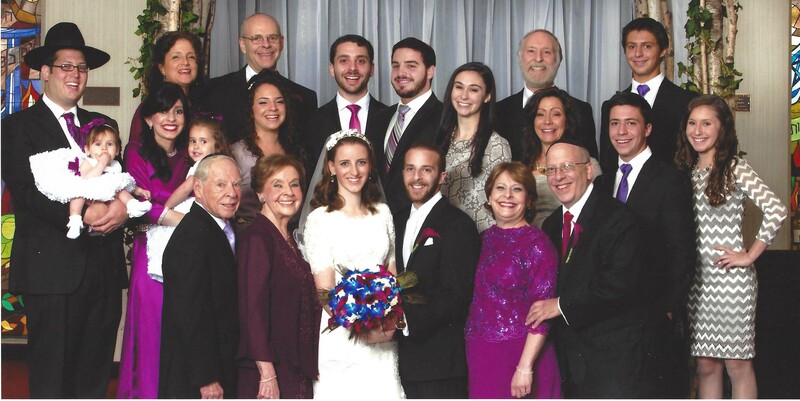 To the left of David is Rachel and husband Michael, our youngest son. 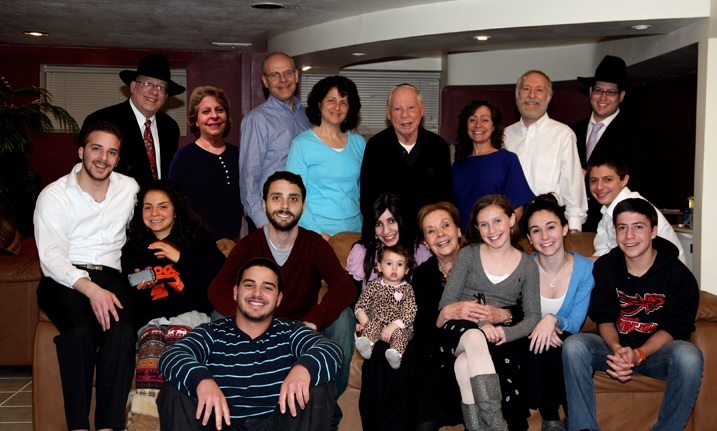 Pictured in the first row, left to right, are Arielle, Joshua, Ian, Hunter, Jordan, Yoav, Dahlia and Gavriel. A story of survival and continuity.